The Dordogne is at the heart of some of the finest vineyards in the world - Bordeaux, St Emilion, Monbazillac, Bergerac, Cahors and many others are all close to here (although not all strictly in the area covered by this website). Note that although south-west france is rightly famous for its wines, the dordogne includes few of the well known vineyards (eg Bergerac, Monbazillac) while most fall a little to the east, south and west... Having said that the Bergerac wines are increasing in quality each year and are generally thought to be an up and coming wine appellation. The main wines in the Bergerac area are: Bergerac, Pecharmant, Monbazillac, Saussignac, Rosette and Montravel. There are numerous caves in the region where you can try the local wines, especially if you head a little to the east or west. Many people visit the region expressly to sample the wines, and such a visit usually includes the Chateau at Monbazillac, and several of the internationally renowned caves around St Emilion. A trip to the Maison du Vin at Bergerac will give you some information about Bergerac Wines. Pick up a leaflet from here or the tourist office and this gives details of all the chateaux in the area with their opening hours, addresses and languages spoken. They are all keen for you to visit their chateaux for a wine tasting and they all sell their wines direct. 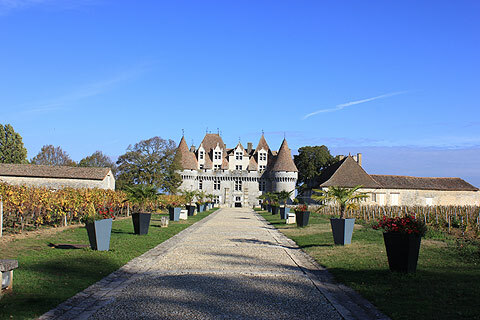 Some like Chateau de Tiregand also offer tours of their vineyards, wine-production area and cellars, often with at least some tours carried out in English. Other Chateaux offering visits include the Chateau de Renaudie and the Chateau d'Elle. If you are travelling around the Dordogne in a motorhome note that many of the chateaux welcome camping cars. For a comprehensive list pick up the 'Carte touristique du Vignoble' at the tourist office. Try also medoc, margaux, pauillac, sauternes, entre deux mers, and bordeaux wines - many of the most highly reputed wines in the world are produced here in southwest france. St Emilion deserves special mention, being listed by UNESCO as a World Heritage Site. The village itself is very, very attractive. It is found about 45 minutes drive from Bergerac on the road to Bordeaux. If you are flying into or out of Bordeaux and driving to the Dordogne region, St Emilion makes the perfect place to break the journey.